GORKI, May 14. /TASS/. Russian Prime Minister Dmitry Medvedev will present his proposals on the new government’s structure to President Vladimir Putin on Tuesday, his Spokeswoman Natalya Timakova said. "Under Article 112 of the Russian Constitution, which says that not later than a week after being appointed as the head of government he presents his proposals to the Russian president on the structure of federal bodies, the prime minister will suggest the structure of cabinet of ministers," she told reporters. Speaking on if the decisions on the personnel may be announced on Tuesday, Timakova said: "No, this does not mean this." 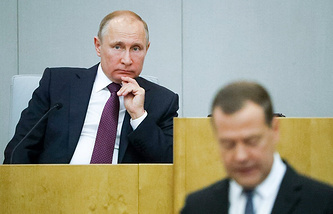 Earlier, Acting Kremlin Spokesman Dmitry Peskov did not rule out that Putin could meet with Medvedev on Tuesday. Peskov told reporters that the deadline for the prime minister to present his proposals on the new cabinet "is coming." On May 8, Dmitry Medvedev was appointed the prime minister after his candidacy had been approved by the State Duma, the lower house of parliament. In no less than a week, the prime minister presents to the president his proposals for the structure of federal bodies of state power. The week-long deadline expires on Tuesday. Russia’s Constitution does not specify the form in which the premier may present his proposals to the president.